Hopes, dreams, aspirations…everybody has them, but not everyone lives to see their dreams become a reality. Carolynn and Gene Mau started thinking about building a tea house in rural southwest Saskatchewan over 30 years ago. Yes, 30 years. And this is their story. But drinking tea will only be a small part of what will soon take place at Rabbit Hill Tea House, just a few miles south of Lake Diefenbaker, when they finally open their doors. This story is about one Saskatchewan couple with a vision to offer who they are and what they have to the community. Do the math, and you may notice that this was right about the time when the tea house idea began to take shape. They got the windows from the old Elmwood School in Swift Current way back then; big, tall, steel, palladian windows that just seem to cry out for a tea house to be built around them, and then carefully placed in a lovely flower garden. But the building would not begin on their acreage, seven miles east of Stewart Valley, until the spring of 2008. And a lot of other things would need to take place before then. Eugene Mau would need to leave his family and farming community near Donnelly, Minnesota, and do the same. War was raging in Vietnam at the time, and pulling out of the engineering program at a local university meant that he might be drafted. California Lutheran Bible School, where Carolynn and Gene met, was not a magnet for draft dodgers back in the 1960s. Gene was fortunate, and the call to join the war effort never came. Married in 1969, this young couple would then make their way to the University of Minnesota. Over the years they would also study at the University of Oregon, the University of Saskatchewan, and the Lutheran Brethren Bible Institute in Fergus Falls, Minnesota. 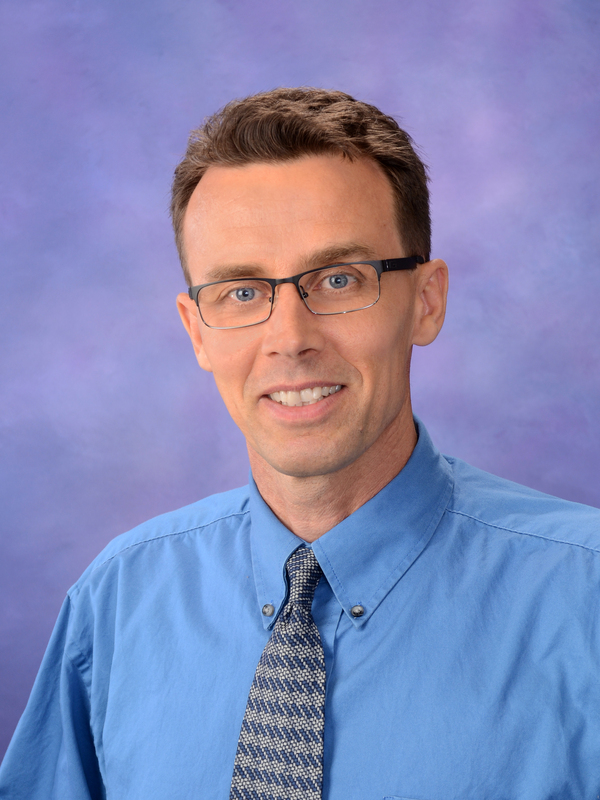 When all was said and done, Carolynn had enough academic hardware to make a good living as a public school teacher and principal, while Gene was ordained as a Lutheran pastor and trained as a professional counselor. While she was qualified to teach, and did just that for close to 30 years, teaching was never really her dream. She did enjoy, however, the relationships that she was able to develop as a result of teaching. “The best thing was undoubtedly the many wonderful kids who I still call my own,” she says, and continues on describing the warm relationships developed with many of the parents over the years. Teaching at Stewart Valley Elementary School meant that she was able to get to know many people right in her community. More of a free spirit, creativity and cooking, nature and beauty, were what really appealed to her. “They had a list of characteristic for entrepreneurs,” Carolynn says, referring to the Entrepreneurial Center in Swift Current, “and they were dead on for me.” She continued, “Perhaps I would have been happier as an entrepreneur/artist right from the beginning.” But creativity and artistic ventures were were not highly valued back then; times were a little tough in rural Saskatchewan, and the focus was understandably on working hard in order to survive. “I always wanted to be at home in the garden, “Carolynn says. But she carried on teaching and kept drawing pictures of the tea house, that one day would be nestled among her flowers. Gene had been a pastor in Canada, and in a similar role in Pakistan although in different culture. But when they returned to Saskatchewan, with a family to feed and needing a bit of a change, Gene got into construction. Looking back now, Carolynn must be really glad that he did. Over the years, Gene would usually view his new carpentry skills as a hobby, but it proved to be a very valuable pastime. First, they bought and renovated an old character house reminiscent of the house on the TV show The Walton’s. It was fine for a family of six: Elke, Christiaan, Sofia, Justin, Carolynn, and Gene. Nobody named John-boy. Next came the gazebo in the garden; a 25th wedding anniversary present for Carolynn. This was followed by renovating an older building to be used as a bed & breakfast cottage towards the end of the yard by the pond. Another anniversary present. 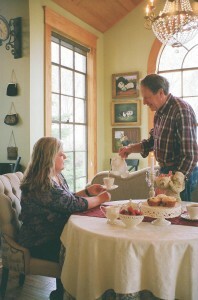 The tea house is Gene’s 40th wedding anniversary project. “And I have lots of ideas for the 50th,” Carolynn says laughing. Gene also played a critical role in setting up what turned out to be a stepping-stone business towards building the tea house: raising golden doodles. Carolynn always loved animals as a child, and her dream-maker husband went right to work building the kennels for her furry friends. Dimitri, the patriarch of the dog community, has also become Gene’s faithful friend. Going on lots of walks is one sure way to was to make a dog happy. Perhaps Gene recalled his dog Tippy, back on the farm in Minnesota, as he walked through the wheat fields near his new home in Saskatchewan. “Five years ago I would have said, maybe,” Karen Bonesky, the former manager at the center said. “Right now, I think your timing is right on.” Rabbit Hill is located close to the Beaver Flat Resort Village and the Saskatchewan Landing, both of which had grown in popularity as tourist destinations on Lake Diefenbaker. At the same time the Saskatchewan’s economy was doing well. The Mau’s had something attractive to offer people with a bit more discretionary income, and a role to play in the development of tourism in the southwest. So they went ahead. But early on they had to deal with delays. The Saskatchewan contractor they had hired to build the foundation and work with Gene building the basic structure had a nasty experience with a cow on his ranch. “He had to recover from being dragged through his corrals by a cow at the end of a rope,” Gene says sympathetically. Darcy Patzer had been trying to help one of his cows give birth, and it was almost the end of him. After a month, it was encouraging to see the tea house begin to take shape. But they had only just begun. “You can have all the vision you want,” Carolynn says, “but you also need to have a really strong work ethic.” Watching Gene install the decorative oak paneling on the ceiling of the tea house reminded Carolynn of Michelangelo working on the ceiling of the Sistine Chapel. “It is for someone who has a tremendous tolerance for the monotonous,” Gene says. The building continued over the next two years, and by the summer of 2010 Carolynn and Gene were both discouraged and exhausted. Gene’s hobby had turned into another demanding job. Although Carolynn had worked an extra year to help fund the tea house, she was now retired and the pressure was now on to finish it. In addition, their daughter, Elke, was getting married. This was very much a positive event, but Nathaniel and Elke’s wedding reception was scheduled to take place at Rabbit Hill, and Carolynn and Gene wondered how they would ever be ready in time. And while many people where encouraging, discouraging comments came their way as well. One man briefly poked his head inside their tea house and declared, “This place is never going to pay for itself, is it?” Of course they had a back up plan in place if it didn’t, but his conclusion did seem a little premature. It wasn’t helpful either. And then they had to deal with the government. “You have so many hoops to jump through and so many people breathing down your neck,” Carolynn says. It didn’t seem like the government was really trying to encourage people to develop a small business. Instead, the whole process of setting up a business seemed unnecessarily difficult at times. “We have both had times when we have just been thinking…this is crazy,” Carolynn says. But they pressed on. They encouraged each other. And they kept building. Thankfully they were not alone, although it felt that way at times. Sitting in their living room in 2011, Carolynn corrects their perception during the “valley” experience of the project: “I do not think it is crazy. I think it is viable and I think it is a good thing…good for the community,” she says. The Mau’s plan on making a profit, but a utilitarian philosophy definitely does not drive this business venture. Carolynn and Gene see it, rather, as a way of offering what they have and who they are in order to benefit other people and build community. Carolynn’s father, Sydney Olson, taught her the importance of doing something with her life that would help others. Rabbit Hill Tea House ties into that. For example, they have a very attractive character home, large trees, and a beautiful yard and garden in the country. “A day in the country is worth a month in town,” Carolynn says, quoting Elizabeth Barrett Browning. Living on a prairie oasis, they want to share their peaceful surroundings with others. “Carolynn’s eye for decorating, the yard area, the garden, the flowers…a lot of people comment on that,” Gene says. Not everybody has a beautiful and peaceful place to call home. Taking a break from a busy urban lifestyle, and leisurely walking down a cobblestone path that meanders through a peaceful garden can sometimes put a lot of problems in perspective. Just sitting and watching the ducks waddling across the lawn doesn’t hurt either. Cows are close by. “It is so much our own in terms of personality, who we are, and what we are about,” Carolynn says. Carolynn and Gene are very relational, and they want to offer a dining experience that is conducive to meaningful conversation. Ambiance and aesthetics, mood and comfort, excellent food and lingering conversation – all of these things are very important to them. A rural renaissance in southern Saskatchewan is something else they hope to encourage at Rabbit Hill. Over the years some of the cultural and community activities have shifted from the rural areas to the larger centers. “But, why can’t we have relationships and good things here?” Carolyn says. Selling golden doodles to people across Canada has already allowed some people to discover rural southwest Saskatchewan for the first time; the tea house could have the same effect. “People don’t know about southern Saskatchewan; they really don’t. And they come here… and they are amazed.” Carolynn says. 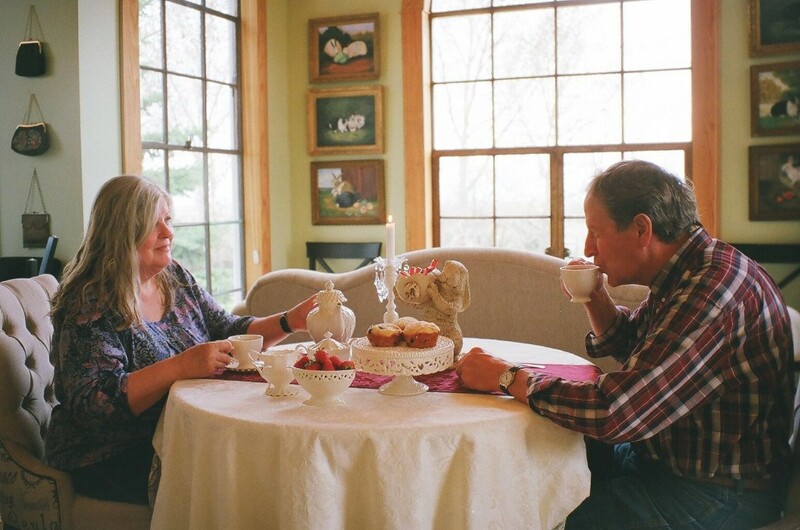 “We are embracing the world with the bed & breakfast and the tea house,” Carolynn says. While this is exciting, there are some boundary issues to consider. Making their family a priority means that they are going to be closed when the kids come to visit. Commitment to family remains unchanged. The larger community is also going to benefit when they start making a return on their investment. Compassion Canada is the charity they have chosen to receive a percentage of the profit. They will not be sponsoring a specific child, but rather clothing and feeding a variety of children by contributing to Compassion’s general fund. Compassion Canada is a well respected charity that takes care of children in Africa and other less fortunate countries around the world. Locally grown produce will be featured at Rabbit Hill as much as possible. Salads, soups, saskatoon pie, and artisian breads will be included on the menu all utilizing prairie grown produce. As Gene notes, finding coffee beans on the prairies might be a bit of problem. “I am finally getting to do what I have always wanted to do,” Carolynn exclaims. “What a blessing! What a joy!” As for Gene, he finds it satisfying to have had a part in fulfilling a dream for his wife. It has taken three decades, but Carolynn’s country tea house dream is about to become a reality. The grand opening for Rabbit Hill Tea House is just around the corner, in April 2011. And it will be exciting to see many other dreams become a reality, here in Canada and all around the world, in the years ahead. © Career & Life Direction 2011-2012. All rights reserved.